Home / Search by Media Type / 12 " / TROOPER: Knock Em Dead Kid LP 1977 platinum album. Check all SAMPLES (edits) and video of the singer! 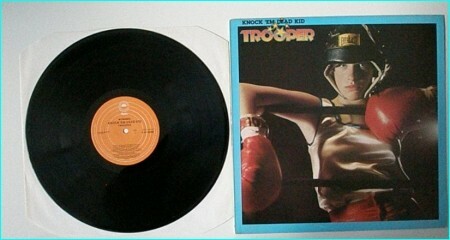 TROOPER: Knock Em Dead Kid LP 1977 platinum album. Check all SAMPLES (edits) and video of the singer! Knock ‘Em Dead, Kid is the third album by Canadian rock band Trooper, released in 1977. The album was produced by Randy Bachman of Bachman-Turner Overdrive and The Guess Who fame. Bassist Harry Kalensky was replaced by Doni Underhill prior to the recording this album, which was the group first Canadian platinum certified album. The album contained the hits “”We’re Here for a Good Time (not a long time)”” and “”Oh, Pretty Lady””. Strong harmonies and a frolicking musical outcrop make Knock ‘Em Dead Kid one of Trooper best works, giving way to three solid singles and helping them become an important musical icon in their homeland of Canada. A blend of both amusing and subtle music. “”We’re Here for a Good Time”” is a peppy, party-all-night kind of tune, while “”Oh, Pretty Lady”” is a truly tasteful ode. “”It Been a Long Time”” is a mild but honest rock song that drifts along wonderfully. Lead Singer/Songwriter for Trooper Ra McGuire, talks about how the band’s driver came up with the name of the song, how they recorded the song and lastly how Michael Bublé almost recorded a cover of the song! One of the 3 greatest albums Trooper ever recorded (along with “”Two for the show””, and “”Thick as thieves””). Great AOR (“”We’re here for a good time””) balanced with touching ballads (“”Pretty lady””), a soundtrack to my youth! A classic album from a legendary band!! Trooper was one of Canada best 1970s pop rockers. 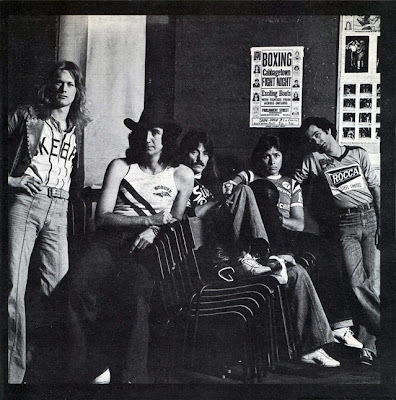 From 1975 to ’80, the Vancouver quintet produced five albums and a dozen top 20 hits. And they’re still around, with founders Ra McGuire (vocals, harmonica) and Brian Smith (guitar/vocals) still touring around the country. Knock ‘Em Dead Kid, the third of four albums produced by Guess Who/BTO founder Randy Bachman — a big influence on the band sound — has the usual mix of rockers (the title track), unforgettable pop classics (We’re Here For A Good Time) and ballads (Oh Pretty Lady). Hook laden, well arranged, they show a band at the top of its form even as it debuted a new bass player (Doni Underhill). this one (I think the first one without founding bassist Harry Kalensky) provides some very solid, very tasteful and genuine non-hit material: the lead (and title) track, as well as “”Cold, Cold Toronto”” provide the strongest examples. The early Trooper releases not only bore Randy Bachman production signature, they also featured him in more than a few solo/leads on guitar. See if you can spot the Bachman! This record represents the peak of the synergy between Trooper and their producer, and stands well on its own as an example of good, solid late 70 CanCon. 5.0 out of 5 stars Go Trooper! We’re all Vol!! SKU: YP-8530 Categories: All Genres, AOR, Hard Rock, Rock, Search by Media Type, 12 "